Include a worthwhile web marketing seminar specialising in SEO for your organisation members' interest and innovative motivation. Next time your association of Australian professionals runs a marketing seminar in Australia include the hot topic of web marketing by Australia's most successful, informative web marketing seminar speaker as part of your overall business seminar in Australia. 4 Web Marketing is an Australian web marketing company with a confident, experienced speaker and professional web marketer of which search engine marketing is one of the activities we excel in. 1st for "web marketing australia" of millions of savvy web marketers. If you are looking for demonstrably the best web marketer Australia wide and experienced speaker to explain this and web marketing strategies, in PLAIN ENGLISH, to members of your networking association at your next Australian business seminar, conference, expo, or convention, then look no further. 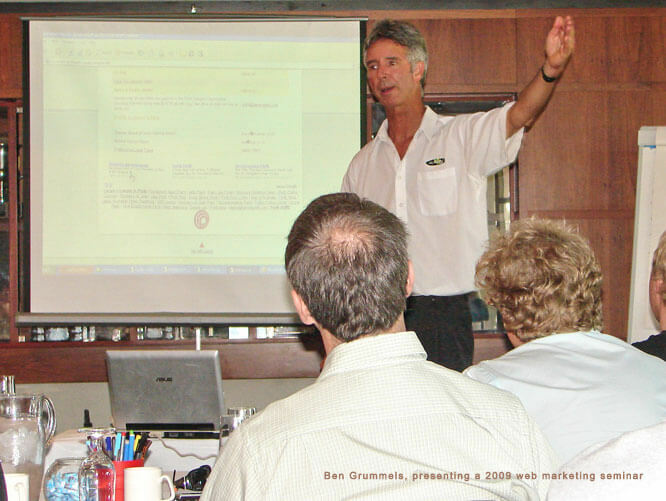 With enough incentive and advanced notice, Ben is willing to travel to your business seminar anywhere in Australia, to divulge his web marketing strategies. Even if your members don't understand all after listening to Ben's web marketing seminar, at least they'll be aware of the problem of their site being lost and know where to find solutions to problems such as poor site popularity. Ben has prepared support material and key points for web marketing seminars which can be modified to suite your time frame and needs of seminar participants' industry or focus. Not-for-profit organisations including industry organisations or commercial associations are eligible for significant web marketing seminar discounts if the business seminar is held in Australia. Whether you're part of an association of car hirers, tourism association or wine growers association, etc it doesn't matter. If your members market their professional services or goods, they'll be interested in and get benefit from our web marketing seminar. Ben's most recent public speaking was for 20 minutes at an international Alternative Marketing Conference at the Le Merridien Hotel, Melbourne, Australia and public speaking in Perth at an education conference at the Perth Convention and Exhibition Centre. 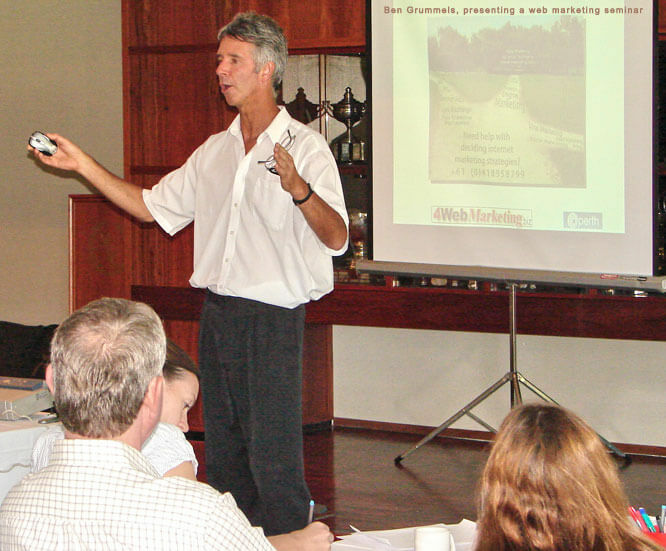 Invite our web marketing seminar speaker and we'll even provide free web marketing for your Australian seminar event. 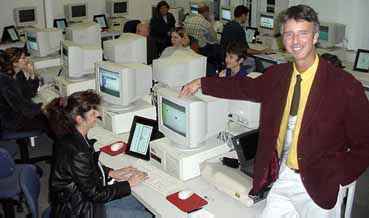 After all we're 1st for "events marketing australia" on major search engines. Travel and accommodation arrangements by seminar organizers. $1,100 per hour or $20 per seminar participant, which ever is the greater. HUGE discounts for Not-for-profit organisations. Early booking with a $660 deposit. Demand for Ben on the Australian speaking circuit might mean disappointment. Phone via Web Marketing Seminar Phone Details Below. "The best site is useless if it's lost in CyberSpace."